The Blog of the Hobbit: The Original One Ring? A Roman artifact found in Silchester, Hampshire, UK, may have inspired Tolkien to write about the One Ring. Being a language professor, he was consulted about it in 1929, eight years before he wrote The Hobbit! 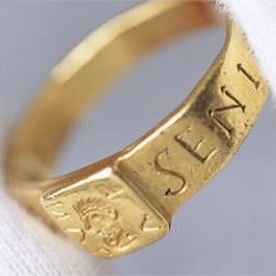 Even though it was found in 1785, this ancient gold ring has been all the buzz now in Tolkien circles. This Roman ring was found in the ruins of Calleva Atrebatum, now known as Silchester, Hampshire, UK. It was associated with a 'curse tablet' which laid a curse on anyone accused of stealing this ring from its owner. In 1929, archaeologist Sir Mortimer Wheeler consulted J.R.R. Tolkien concerning the wording of the curse, since Tolkien was a prominent language professor. That meeting may have been the inspiration for the magic ring found by Bilbo Baggins. The ring is now on display in The Vyne also in Hampshire, UK, a National Trust property. The display also includes an original edition copy of The Hobbit, thanks to the Tolkien Trust.